Nile Crocodiles Found Near Miami, Researchers Confirm : The Two-Way Three crocodiles captured near Miami in 2009, 2011 and 2014 are indeed Nile crocodiles. They are bigger and far more aggressive than the American crocodiles that are native to the Florida Everglades. 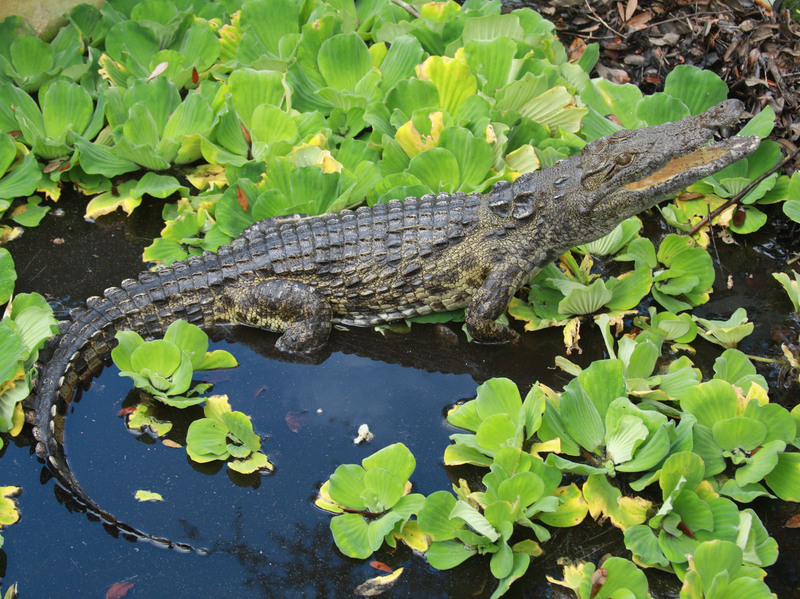 University of Florida researchers recently published a paper showing that captured reptiles in 2009, 2011 and 2014 are Nile crocs. All of these creatures, which include Burmese pythons and carnivorous lizards, have turned up in Florida in recent years, sparking concerns about possible damage from invasive species and questions about how the nonnative animals came to be in the state. "I've heard of enough sightings of a strange-looking croc in the areas that are connected to this to make me think it's possible," University of Florida biologist Frank Mazzotti, one of the scientists who confirmed the crocodiles' species, told the Herald. "But yeah, I don't think we've pulled out the last one yet." Using DNA, Mazzotti and another biologist, Kenneth Krysko, "also confirmed the crocs don't come from any known captive populations," the Herald adds. Krysko said "the captured crocodiles matched genetically, meaning they are related to one another, but didn't match Nile crocs kept at Disney's Animal Kingdom and other licensed Florida attractions," The Associated Press reports. So how did the aggressive crocodiles — which, according to the AP, "are believed to be responsible for up to 200 fatalities annually in their native sub-Saharan Africa" — get to South Florida? "They didn't swim from Africa," Krysko told the news service. "But we really don't know how they got into the wild." The AP says the crocs, a species whose adult males can grow to 16 feet and weigh up to 1,600 pounds, were very likely "brought to Florida illegally by an unlicensed reptile collector who either didn't contain them properly, allowing them to escape, or, more sinisterly, planted them in the Everglades in hopes they would multiply." With any invasive species, there's a risk of disrupting the ecosystem. As NPR reported earlier this year, in the past two decades, the Burmese pythons, which can grow up to 20 feet, have "taken a big toll on native wildlife" in the fragile Everglades ecosystem. In fact, their presence has become so problematic, Florida's Fish and Wildlife Conservation Commission held an "event where it showed prospective hunters how best to corral a 10-foot-long snake," NPR's Greg Allen wrote. "While no one's suggesting the Nile crocs may become the next Burmese python, their presence does raise concern. This species, commonly found in South Africa, can live in colder regions — a range that would extend as far north as Savannah, Ga. A special state permit is required to legally possess or breed Nile crocs in Florida but there is fear that illegal trade in the reptiles could increase the risk of more escapes." In an earlier version of this post, the fact that DNA tests showed the crocodiles were not from any known captive populations was not attributed to the Miami Herald. The post has been edited to add that attribution.